Disregarding President A.P.J. Abdul Kalam’s objections to some of its provisions, the UPA government today decided against making any changes in the controversial Office of Profit Bill. Pakistan, which has rejected New Delhi's demand to hand over underworld don Dawood Ibrahim and Hizbul Mujahideen chief Syed Salahuddin, has said it will not allow leaders of banned militant groups like Lashkar-e-Toiba and Jaish-e-Mohammed to be questioned by the Indian police. Will debarring the notings on official files from public domain weaken the Right to Information Act? In a dramatic twist to the reports that one of India’s most wanted men, Syed Abdul Karim alias Tunda, had been nabbed in Mombasa, the Kenyan police said tonight that the arrested man was a West African national amid media reports that he had been handed over to the FBI. 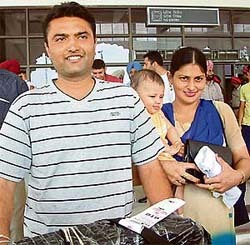 As many as 54 Indians, all from Punjab, today arrived at the Rajasansi International Airport, by a special Air India flight (AI-187) from Mumbai, after being evacuated from war-torn Lebanon. Around 10 Israeli armoured vehicles today crushed a border fence and entered Lebanon, driving past a UN observation post, an AFP Correspondent reported. The Punjab and Haryana High Court Acting Chief Justice, Mr Justice H.S. Bedi, has constituted two high-level committees to study afresh the issue of alleged irregularities in the selections for PCS (Executive) and PCS (Judicial) made by the Punjab Public Service Commission under the then Chairman, Mr Ravinderpal Singh Sidhu.